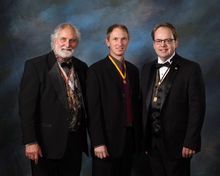 Accompanied and sponsored by long time friend and highly accredited Jim Chagares (Master Photog., MEI.Cr., and F-ASP on the left) and PPA President Rob Behm (on the right) Lance Carter earned the title Master of Photography from the PPA during this year's Image USA. Carter is honored with one of his bird images in the NANPA 2018 Showcase. 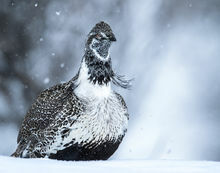 This little Sage Grouse in the Grand Tetons National Park never stopped the hunt for food. Temperatures reached below -30F during these days of photographing this tough survivor. The Western Division PPA competition awards Carter 2nd Place in ranking for total points. Photographs "Crater Lake in Orange", "Fenced In", "Morning Glow at Wizard’s Island", and "Streaming Rocks" all rank high. North American Nature Photographer Association (NANPA) has ranked Carter's image, "Mother's Burden", in the top 100 of their mammal category. This image captures an enduring moment of a mother Howler monkey and her young in the wilderness of Honduras. The results are in and Prof. Photographers of America (PPA) at their International Competition (IPC) has awarded two images, "The Magic Cavern" and "Crater Lake Ablaze", top appreciation with Loan status. They will both be displayed during the 2017 Image USA conference. Another image, Piering to the City" has made the grade with receiving a merit as well. 10/15/2015: Panoramics Get Some Love! 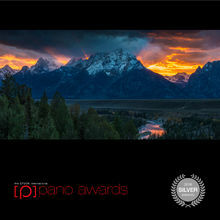 Epson International Photographic Pano Awards honor Bronze awards for images "Easter at Mesa Arch" and "The Colorado" while "Winter at Mormon Row" and "The Big Reunion" earn Silvers. The verdict is out that the PPA also likes Carter's images. 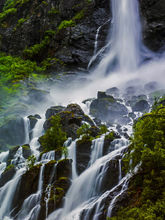 His first year Carter has earned six merit points with two of his images getting the highest honors for the International Photography Competition by being awarded loan. Both "Gateway to the Pacific" and "Painting the Beach" were honored with merits while "Maine's Morning Lights" and "Orange over Blue" received the additional top honors of the IPC. This makes Carter a Gold Medalist for this year’s International Photographic Competition! Standing Tall, Spirit, and Patience were awarded Nominee status by the prestigious Black & White Spider Awards in their 9th Annual competition. We are honored that NANPA has chosen "The Big Reunion" for its 2015 Showcase. This is a rare capture of one of the largest winter gatherings of elk in Wyoming's National Elk Refuge reported over a fifteen year period. Best of Nature Photography Show for 2013 at the Ordover Gallery in the San Diego Natural History Museum has honored the image "Winter's Repose". This rare close up of an adorable polar bear will be on display from September 2013 to January 2014 at the Ordover Gallery. Panoramic images "Autumn's Rainbow", "Resting Sails", and "Winter Wonderland" win awards in the prestigious Epson International Photographic Pano Awards. Carter received an award for his image "Heart of Spring" photographed in Newfoundland, Canada. This is an especially favorite image of the Northern Gannet taken in one of the largerst Gannet colonies in North America found in a remote part of Canada. The intense look of these striking birds sharing a moment of courtship pulls you in. 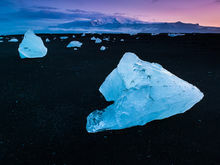 "Icelandic Cubes" wins an award in the International Loupe Medium format competition. This image is an incredible display of the unique terrain Iceland has. Carter remarked how sometimes light and the environment all seem to work together for you and when it happens it's amazing. Panoramic images "Magic Cavern", "Painting the Beach", "Snowclad Zion" and "Maine Morning Lights" win awards in the prestigious Epson International Photographic Pano Awards. 10/05/2011: Carter heads to Washington DC!! Carter's image "Alaskan Tan" has placed as an Highly Honored image in this years 2011 Windland Smith Rice International Awards. The art work will be displayed at the Smithsonian Natural History Museum during 2012 and Carter will be there for the opening ceremony. The work was photographed in a very remote island sanctuary off the coast of Alaska where few have ventured. "Star Dust" wins an award from the 2011 International Loupe competiton Medium format section. 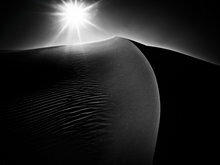 This is an incredible Black & White image from the White Sand National Monument Park that plays with the light as the sun crests the sand dune. Carter's image "When Heaven Touches Earth" wins him the title as a Highly Honored Photographer in the 2009 Nature's Best Windland Smith Rice International Awards. The art work will be displayed at the Smithsonian Natural History Museum during 2010 in their High Definition video. This very dramatic work is of an oncoming rainstorm at sunset in the northern part of Wyoming.